Beautifully located at W Hwy 76 in Branson, Missouri, Fritz’s Adventure is one of the most dynamic family attractions in Branson that offers extreme outdoor adventure in an indoor environment. Fritz’s Adventure facility has an area of 80,000 square feet that features hands-on climbing, sliding, tunneling, and zip-lining thrills. 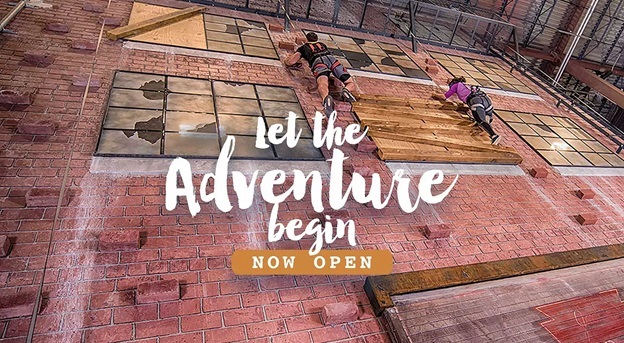 It also features daunting utility poles to climb, bridges suspended stories above, towering rock climbing walls and giant boulders, three impressive warped walls, urban brick buildings for scaling, a massive ropes course, a life-size water tower, multiple slides, tunnels and tubes to burrow in, and an air-worthy airplane to explore. This indoor attraction in Branson brings the excitement and challenges of outdoor adventure inside a multi-dimensional indoor environment. Although Fritz’s Adventure delivers a perceived element of risk, it is strategically engineered and durably built so that guests can enjoy a safe adventure in a safe environment. This is a place where you can enjoy the elements of the world around you that such extreme outdoor adventure would not be encouraged anywhere else. Kids and parents alike are encouraged to explore the adventure together for a truly unique family fun experience in Branson. In addition to extreme outdoor adventures offered in this indoor attraction in Branson, Fritz’s Adventure features a restaurant that offers healthy menu choices. The indoor adventure park in upper mezzanine and rooftop party rooms are offered for groups of any occasion. For the first time, Fritz’s Adventure is offering exciting challenges that are normally reserved for seasoned adventurers and be a part of Branson’s family adventures with no discrimination on age and ability level. At Fritz’s Adventure, you are sure to experience a world of great outdoor adventure year-round in an indoor environment. Fritz’s Adventure has its favorite sayings called “Let the Adventure Begin”. Whether you are a first-time adventurer wanting to experience the thrills of outdoor adventure or a seasoned adventurer looking for a challenge in an exciting indoor environment, Fritz’s Adventure is the place to enjoy the thrills. The facility is beautifully engineered to have a safe adventure for visitors of all ages. It’s a perfect place for families to adventure together. Fritz’s Adventure is a conglomeration of natural and man-made structures built as an adventure park and meant for exploration that carries a perceived element of risk but located within a strategically-engineered and safe environment. Young and old adventurers will be able to enjoy extreme outdoor adventure in a world that wouldn’t be possible in any other scenario. For those interested to experience extreme outdoor adventure at Fritz’s Adventure, may purchase tickets on-site. For Jr. Adventurer ages 4-11, ticket price is $21.95; for Adventure ages 12+, ticket price is $29.95; and for Sr. Adventurer ages 55+, ticket price is only $14.95. Children 3 and under are free. Fritz’s Adventure provides a 50% discount off of a single admission ticket for any active military member or veteran. Fritz’s Adventure is a dynamic family attraction in Branson where you can enjoy extreme outdoor adventure in an indoor environment.